Up until this point, I have kept all of the windows in my apartment open. I live in an older apartment building where I am not able to control the heat. So things have been unnecessarily warm. Opening the windows has allowed me to somewhat regulate the temperatures throughout December. Yesterday I made the bold move to shut the windows as I began preparing dinner. Soup. There is nothing better, or more comforting, than a big bowl of piping hot soup on a cold winter's night. After taking some notes from a recent Buzzfeed article, I decided to use one of their recipes for inspiration. Tempeh? No, I'd rather just made a vegetable soup. Curry? I love curry. Kale? How basic does that make me? As I sat watching the stars The Golden Globes in Los Angeles, and devoured this soup, I almost for a moment forgot that I was in Chiberia. Okay, no I didn't. The drafts from my windows and door are incredible. Cold breeze all the time. Heat the olive oil in a large pot with a lid over medium heat. Add the onion, garlic, and celery, season with salt and pepper, and cook, stirring occasionally, until the onion and celery start to soften and the garlic is fragrant, about 2 minutes. Add the squash and curry powder, stir, and cook until the curry powder is very fragrant, about a minute. Add the chicken stock and season with a little more salt and pepper. Turn the heat up to high and bring the mixture to a boil, reduce to a simmer and cover. Simmer, covered, for 20 minutes, until the squash is very soft. When the soup is puréed, add the kale leaves and stir to combine. The heat of the soup will wilt the kale. 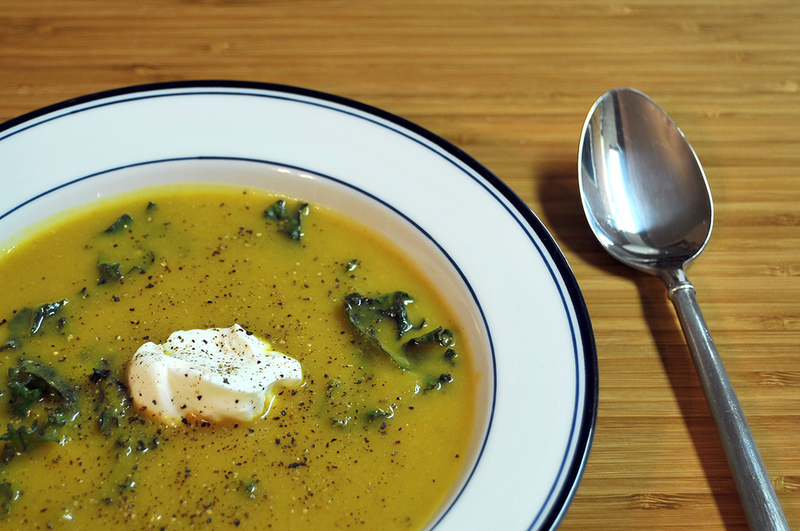 Transfer ⅓ of the soup to a bowl, top with the Greek yogurt, and serve immediately.